Your vehicle’s engine keeps you moving on the road, but your brakes are vital to helping you avoid accidents and the dangers of the road. From the shoes and pads to disks, rotors, and drums, the brake system components need periodic service and maintenance to keep you safe. 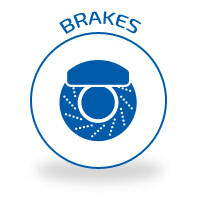 If you notice noises like squeaking, squealing, and grinding, have your brakes inspected right away. As you use your brakes to stop the weight and momentum of your vehicle, the brake pads become worn down until there is no material left – metal grinding on metal can cause serious problems and lead to more costly repairs and replacements, including cracked or warped rotors and damaged brake drums.